Use the green "?Help" button below - on the righthand side of every page. If this is the first time you use our helpsystem, make sure you check your email inbox for the confirmation email! Well, Spring is on our doorstep, so high time to treat your wooden floor after this long, wet and often colt Winter. Especially when you have underfloor heating, your floor will have dried out (a bit). But also without underfloor heating your wooden floor will definitely benefit from a maintenance treatment to keep it healthy and beautiful again. Treating your floor is - like all things modern - very easy, using Saicos Eco-Friendly products you will have this job done in no time at all. Just add some Saicos Wash-Care to a bucket of water, wring out the cloth very well - wood likes water as long as it was a tree, after that be careful - and wipe the floor clean. Let is dry and then just sprinkle Saicos Wax-Care over the clean floor, wipe it out with a dry cloth and job done! For in between maintenance, say for instance when you notice a particular area is getting duller, you can use the Saicos Wax-Care Spray. Maintenance of wooden floors no longer means having to turn your room up-side-down (or even storing your furniture in the garden). Maintenance has become very easy, why not try it yourself! Your floor will love you for it! For you convenience you can purchase both products (Saicos Wash-Care and Saicos Wax-Care polish) in one Saicos Floor Care Set! The winter slowly runs out of breath. Prepare your terrace ready for Spring now! Removes mould from all outdoor woods, including natural and artificial stone terraces. Effective and biological degradable concentrate for effortless removal of mould and similar infestations. The weather protection and care finish for wood decking, garden furniture and terraces. The natural oils even the surface, make it smooth and emphasise the grain of the wood. Let the Spring bring is on! Your garden will soon be ready for the sunshine! Maintenance product for waxed/oiled wood floors. Can also be used to revitalise re-discovered parquet floors which have been oiled/wax before. Polishing Wax of superior quality, produced by the original recipe by Aunt Polly (from Wales). It is a mix of beewax and fossil plant wax, which contains real turpentine (*1). The polishing wax is available in ivory white (natural colour),traditional yellow (light yellow) of dark brown. These give a warm and antique colour. This extraordinary polishing wax gives a brilliant shine and accentuates the veins of the wood in a beautiful way. Your wooden floor obtains a high protection as polishing wax nourishes the wood and goes against dehydration, but also protects against humidity. The ivory white (natural) can be used best on bare wood (for instance with restoration projects), it will act almost as a transparent coat. The traditional yellow can be used best for revitalising oiled floors of any colour while the dark brown revitalises faded originally stained wooden floors. Also highly suitable for polishing wooden furniture. The best product to use for now - which does mean "hand and knees" work - would be Aunt Polly's polishing wax - light yellow. In the olden days this was used to treat bare wood (a coat of 4 - 5 applied), but in this circumstances you could apply 1 coat over areas still "covered" by the existing oil/wax finish and 2 coats (at least) on the bare areas. Normally around this time of year we warn you about salt from gritting icy roads etc effecting your floor and how best to protect it. Well, for Christmas 2018 we might even have a Spring feeling in the air! In our latest newsletter we already mentioned that wooden floors benefit from extra TLC. 'Pampering' your floor by applying a maintenance product every 5 to 6 months will keep the wood protected against dirt and drips and enhance its beauty. Special care is recommended when it rains all day and you want to take an after diner stroll. Not all entrance mats 'wipe' the bottom of your shoes completely dry. Leave shoes in the porch and have slippers at the ready - warmed-up slippers is really a nice treat after a walk in wet weather. Wipe wet-shoe prints dry the moment you notice them so the moist doesn't get a change to effect the wood. And of course: have a Merry Christmas and a very Happy New Year! You might have guessed it already, this month - December 2018 - is the last month of our 15th Anniversary celebrations. And what a year it has been, and we're not just talking about the glorious summer weather we had month on month! This last month you can still take advantage of the Annivesary discount, now standing at 4%. In the New Year it will revert back to the normal discount of 2,5% - if you are a Facebook fan of our company too, you know where you can find the new code for 2019. If not, Like our Facebook page now so you too will receive our discounts when you order your products for your wooden floor online in our secure webshop! Perhaps you know all about Wash and Go - using Saicos Wash-Care for fortnightly cleaning which does not leave your floor dull as a result, as we explained in an earlier post this month. Simply dilute the product in water and soak your floor with it - but do not leave it longer than 15 - 20 minutes! Then remove the water and the dirt from your floor with non fluffy cloth. Your floor will look brand new! Nothing cleans better and more ecofriendly then Saicos Ecoline Magic Cleanser, so order your can today! The above sounds like a commercial for shampoo, doesn't it? Still, it is in a twisted way true, but not to wash your hair. and never ever use a cleaning product diluted in the water that'll harm the floor or the coating of your floor. "Fairy" washing up liquid should only be used on your dishes, never on a wooden floor because it will remove the protective coating and make your floor dull and prone to take on stains after drips. So, why the title of this article still mentions Wash & Go? Simple: Saicos Wash-care is a very specific cleaning product for wooden floors, no matter how they are finished (oiled/waxed or lacquered/varnished). Diluted in water it will not harm your floor (as long as you don't through a complete bucket of water with wash-care over it!). This is because the eco-friendly product contains a little bit of liquid wax that'll feed the protective layer of your wooden floor, once it is dried it does not make your floor dull. And of course, it cleans off dirt! So, Saicos Wash-Care can be used every fortnight without a problem and helps you keep your wooden floor healthy and beautiful. Once every 5 - 6 months your floor does require a maintenance polish, such as Saicos Wax-Care or Aunt Polly's polishing Wax. Happy cleaning, without making your wooden floor utterly dull. Simply Wash and Go. "I am having new stair spindles, handrail and base rail. I would like to use oil to stain it light oak. What is the best method and materials to do this?" The oil we mentioned is - strangely enough - Colour Wax Classic. It is truly a thin oil, and so very easy to apply. On unfinished wood it takes only one coat in the stain of your choice to give it a completely different look. And there are 16 colour to choose from! Not just stair furniture, but all kinds of (unfinished) wooden furniture can be treated with Saicos Colour Wax - it's turning into a real craze in The Netherlands to "personalise" Ikea wooden furniture. Some even sand down a pre-finished piece of furniture to add their own colour. Or, as they call it, to "pimp" it up. "pimp Ikea furniture" or follow this link for an enormous quantity of pictures. And of course, this applies to all kind of wooden furniture, not just from our Scandinavian "friends". As with all Saicos products, this one is easy to apply with a brush or a non-fluffy cloth. Plus it is made of natural ingredients - so eco-friendly too. Go on, have a "splash"
Don't simply wash your floor with water. Rainy days can give you muddy footprints on your floor, cleaning your wooden floor with just water will make it dull and could erase the protective sealing of the polish you applied on it. Do use a special wood cleaning product (diluted in water) to regularly clean your floor from dirt and muddy footprints. Saicos EcoLine Washcare contains a little bit of revitalising wax which will bring back the lustre of your wooden floor. It also contains a VOC-free soft detergent, removing dirt and mud. One can of Washcare - diluted - covers appr 1000 sq meters! Don't worry too much about little gaps appearing this season. It is the "heating" season after all, where the central heating will dry out the air more than during Summer, late Spring and early Autumn. Because wood reacts to the air humidity it will release excess moist and could shrink a little bit. Nothing to worry about, it will expand again when the heating season ends. Do keep an eye on the air humidity in your home, not just for your wooden floor but also for your own health. Like your floor, dry air effects your skin and can make it dry. You can protect the dryness of your skin with moisturising crème, and the health of your floor with a polish. For both lacquered and oiled floors there is the easy to use Saicos EcoLine Wax Care Spray - covers 100 sq meters - and if you have an oiled floor you can also opt for the Saicos EcoLine Wax Care Polish - also covers 100 sq meters. Both products can be applied every 3 - 4 months, so treat your floor now and it will keep its moist better and shrinking could be prevented or be less. Don't walk in grit. In the event it starts snowing this Winter and the gritters will be out and about, be careful to not to get the grit - containing salt and possibly chemicals - into your home and on to your floor. This will react with the polish and even with the wood itself, resulting in stains - which are hard to get rid off. Do place a entrance mat on both sides of the outside doors to wipe your shoes/boots off before entering your home and wooden floors. Best is to remove your shoes/boots after entering and prevent any residue grit getting in the house. What would be nicer coming in from the cold to ease your cold feet in warm slippers! Just a few simple tips to keep your wooden floor beautiful and healthy the coming months. It is easier than you think. Order your maintenance products now and prevent any (slight) damage to the finishing layer and your wood floor. Pine floor - now what? The lounge is made of Douglas fir softwood, is the best thing to use for this the Saicos premium Hardwaxoil in satin-mat finish for a natural look? The Douglas fir softwood floor, this might turn orange when you apply HardWaxOil. Best is to do a wet finger test to see what colour the wood turns into when a natural finish is applied (wet a small part of the floor which should be bare wood). Let me know the result. thanks for your speedy reply. I have done a wet finger test on the Douglas fir and it does go an orange colour. What is the best thing for us to do with this? On pine floors we normally recommend a light stain to avoid the floor going ugly orange. Oak is the most popular stain - also by Saicos, to be followed with one coat of Saicos HardWaxOil. You can find both combined in the Pine Restoration Pack. Hi, we have brand new red pine very light floorboards laid in the 60s maisonette we are renovating and wanted to stain the floorboards to more of a mid oak colour but have been advised not to do this as scratches and general traffic tends to wear poorly and also when the stained (or rather wood dyed) floorboards are put under a rug and the rug is removed, there are then 2 different floor colours so not ideal. Is there another suggestion you would recommend and if so what would that be? we need some thing hardwearing (for a studio and an upstairs landing area). It seems that dyeing the wood is not the best solution. Please can you point me in the right direction or else suggest a wood dye matt protector layer if that exists so that the surface has a more protective layer on it without looking shiny at all....Thank you! Although Pine is a softwood, a proper stain won't wear off that easily - or you have to have heavy to very heavy daily traffic on it. Or of you don't maintain your floor regularly - say once every 4 - 5 months. The story about the colour variations between floor areas with and without rugs is true though. We can highly recommend Saicos Colour Classic - single oil in many colours such as Oak. After this (one or two coats) you have to apply Saicos Premium HardWaxOil - one coat. Our inbox frequently received all kinds of questions, on all kinds wooden flooring subjects. Some are very good questions, others make us think not everyone has a correct understanding of the floorcovering they selected. All oiled floors, not matter which brand oil had been used, can be treated with any maintenance product suitable for oiled floors, so the answer is yes. Some manufacturers of floor oils tell you you have to use only their maintenance products, but our experience tells us all (good) maintenance products - from sprays, polish and wax - can be used to keep your oiled floor healthy, beautiful and protecting it against dirt and drips. When I applied the Aunt Polly, can I then reseal the floor yearly with the HardWaxOil? This is one of those questions that makes us realise that some people do not know the difference between finishing and maintenance products. You only treat your wooden floor with a finishing product - such as Saicos HardWaxOil, or single oils - when it is brand new and unfinished OR if it floor has been sanded bare. A once treated floor you maintain with maintenance products, there is no need what so ever to reseal your wooden floor with another coat of oil once every year. Sellers of wooden floors or finishing materials who tell you that either do not know what they are talking about or are trying to sell you expensive oils. Every wooden floor needs a maintenance treatment roughly twice a year, that should suffice to keep it healthy and beautiful. So: finishing products only once (by yourself on unfinished wood or by the manufacturer when you purchase a pre-oiled floor) - maintenance products every 5 - 6 months. 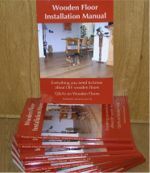 If you need more information on how to maintain your wooden floor, purchase the Ultimate Maintenance Guide in the secure webshop and you will never doubt what product to use when. Enjoying the sunny weather we're having of late? I'll bet you do! "I hope you can help us. We had an Oak floor installed which was finished with UV-oil. Now with all the sunny weather of the recent weeks, the part of floor that gets the sun all afternoon long is still changing colour! How is that possible, we thought with the UV-oil the floor was protected against this???" An UV-oil finish is quite common nowadays. but it sets most people on "the wrong foot". UV-oil means the oil in the factory has certain particles in it that assists the quick factory drying of the oil with UV-light. It does not mean your floor is now protected against the effects of the UV-light of the sun. Any wood floor reacts to light, by turning darker or lighter - depending on the wood-species. The best way to protect your floor (and its colour) is to shade it from intense sunlight during mid-day when the UV rays are at their strongest. Awnings, screens or even soft curtains will reduce the UV effect on your floor. Plus, as you would (should!) do with your own skin to protect it during the most intense sunshine, you can also protect your floor - no matter if it is treated with UV-oil or not - by applying a regular maintenance regime which keeps the surface healthy and will reduce the effect of the sun's UV light. A regular maintenance regime means nothing more than applying a polish or a wax every 5 - 6 months (do avoid treating your floor in direct sunshine, the high temperature of the surface will dry out the polish/wax too quickly and result in a patchy result). The simplest way to treat your floor - and protect it better against the sunshine - is using Saicos EcoLine Wax-Care Spray. Simply spray it on your floor, spread it out with the polish applicator and within 10 minutes the job is done! Treat your floor regularly, enjoy the sun - as long as it still lasts - and don't get burned! I have a herringbone style parquet floor which is in need of some TLC more than anything. The wood is generally in very good condition. There are areas that are scuffed, but this appears to be more surface scuffing than anything else. I think the current protection is a varnish on the floor, as you can see some brush marks in places! What we would like to do is to remove this layer, make the finish a more natural wood finish to brighten the room up a little more if possible. There appears to be no loose tiles from what i can tell. There are some gaps in places, but nothing that is of major concern. What would be your recommendations to bring the floor back to a decent finish without the need to sand it all back, which is a job i really want to try and avoid if possible. Removing varnish without sanding might be impossible, but you could try a thorough cleaning and then applying polish. Thank you for your order, for the works planned they are the correct ones. Follow the instructions on the Magic Cleanser can and you can't go wrong. Have a question yourself, simply use the ?Help button at the bottom of the page.